Facts, directions and stadium code of conduct. Undersoil heating: Yes. Got artifical turf in 2006. Alfheim Stadium is located at top of the island in the southern part. It just a short drive to the airport, no more than fem minutes. And its also a short walk from downtown, only about ten minutes. There are no parking next to the stadium, so either park in the city or take a bus to the ground. 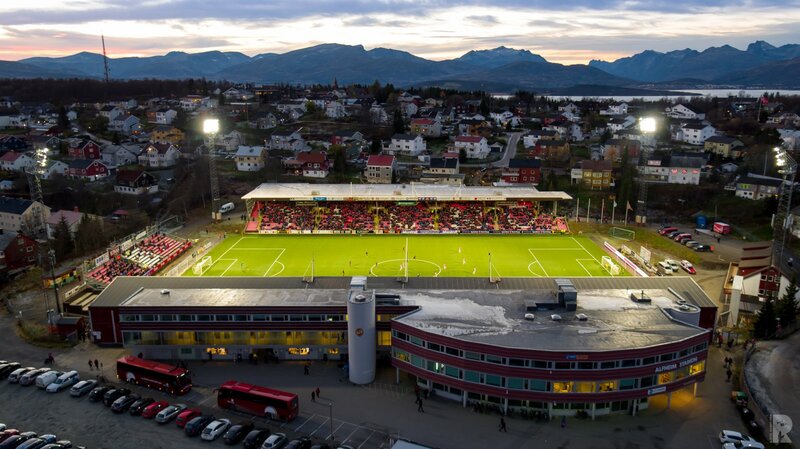 Address: Stadionvegen 3, 9251 Tromsø. Entry to the Ground is expressly subject to acceptance by the visitor of Norwegian Law, these Ground Regulations and the rules and regulations of FIFA, UEFA, Norwegian Football Association, Norsk Toppfotball in respect of the relevant competition. Entry to the Ground shall constitute acceptance of the Ground Regulations. In the interest of safety all spectators must only occupy the seat allocated to them with their match ticket. No movement is allowed. Persons occupying the wrong seat will be evicted. Nobody may stand in any seating area whilst play is in progress. The obstructions of gangways, access ways, exits and entrances, stairways and like places is strictly forbidden. Nobody entering the Ground shall be permitted to climb any structures within the Ground. Ground any person refusing to submit to such a search. The organizer is NOT responsible for any accident/injury, loss or damages to persons/property in or around the Ground. No guarantees can be given by the organizer that an event will take place at a particular time or on a particular date and the organizer reserves the right to reschedule the event without notice and without any liability whatsoever. There will be NO refund of any ticket costs, travel costs etc, if an event is abandoned. Persons influenced by alcohol or any other kind of drugs will be rejected from the Ground area. No goods (including literature) of any nature may be distributed or offered either free or for sale by any person within the Ground without the written permission of the organizer. A television surveillance system is in function outside and inside of the Ground. Tickets may not be offered for sale within the stadium area without the prior written permission by the organizer. Any individual who has entered any part of the Ground designated for the use of any group of supporters to which he does not belong may be ejected from the Ground either for the purpose of his own security or any other reason. All times whilst present in the Ground, persons must comply with any and all instructions of the organizer, any steward or police officer. The organizer reserves absolutely the right to eject from the Ground any persons failing to comply with any of the Ground Regulations.